Our framed sets are all produced at here at the Straffan Butterfly Farm from surplus captive bred butterflies. They are not collected in the wild. There is a limited supply available and each dried butterfly is supplied in a sealed timber frame with an internal mount and brass plate as shown in the picture. These are all perfect specimens and the colours are not altered or enhanced in any way. These specimens will last for at least 50 years but should not be hung where they will be exposed to long periods of direct sunlight as this will cause them to fade over time. Many of the butterflies in our collection in Straffan are well over 100 years old and are still as bright as the day they were originally flying. 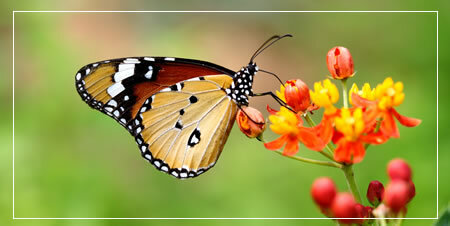 Framed butterflies allow you to enjoy the beauty of butterflies in your own house without doing any damage to their natural populations or enviornment. My interest in butterflies all started as a 10 year old boy when I was given a present of a tropical butterfly in a cardboard box with a clear plastic lid. Please contact us for any further details but the framed butterflies shown here are generally available from our stock so can be despatched within a few days.